Count me among the "Just as I was getting GHA taken care of this crap popped up" crowd. Looking to schedule a multi-day blackout and to look for a way of increasing bio-diversity. Here's a full tank shot. I was being slightly facetious. I didn't literally add them intentionally, I was however doing the same things that people in this thread say they were doing to get rid of hair algae when their dinos appeared. 65 gallons of water volume. Dosed between 7.5/16 and 9/19 ml vodka/vinegar, so plenty excess carbon. Changed food to all low P foods. Dosed a total of 10g KNO3 over 3 weeks to add N and allow P to be removed by bacteria grown and skimmed. GHA declined significantly, P gradually too. Larger skimmate output, Cyano spots began showing up in timing that coincides with changes in carbon dosing. Brown dusting that turned out to be dinos followed cyano by about 2-3 weeks (though not in exactly same spots - more on that later). 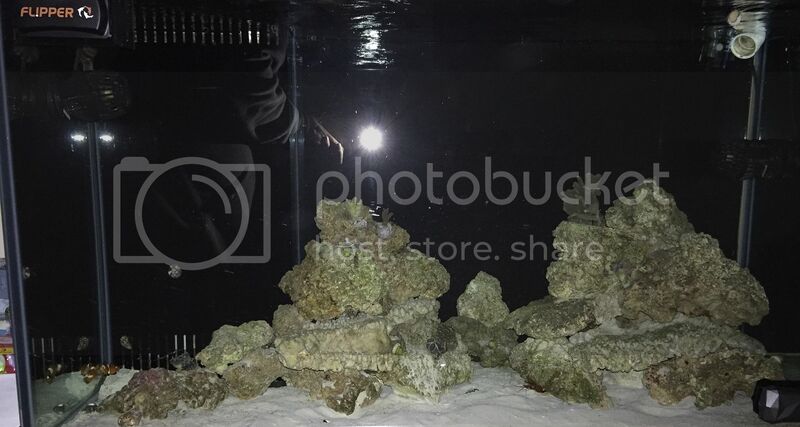 I will update the thread, and I'd never had dinos or cyano in this tank before. Here is how I got rid of ~99% of my dinoflagellates. In October 2015 I had noticed the CO2 had come close to be depleted so I decided to do a test to see the effect of not supplementing any calcium, sodium-bicarbonate or CO2. Nothing was added to the tank besides from food. For 8 weeks the dinos kept doing their thing, but then in the next two weeks they receded so much I was afraid to lose them so I did a 20% water change and dinos started to come back very slowly over a weeks time. 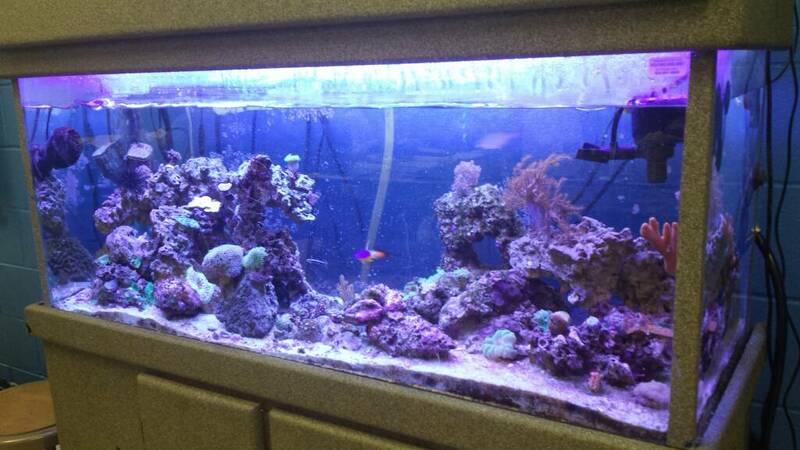 During this week my corals showed the first sign of stress so it was the logical thing to get parameters back to normal for the next round so I fired up the Calcium reactor to go upwards from Ca of 350, alkalinity of 5 and Mg at 1300. Steadily the dino population grew and now it's about the same as usual. The big con is that in the last two weeks the corals have gone from looking fine to really bad so it was the much faster way up than down that hurt them the most. Of course they must have been stressed already living in sub par conditions, but at a glance it seems that going to fast to the reccomended lowest parameter levels did the most damage. It's also possible that increased dino toxicity had an effect. Some trace elements got replaced in the water change, but to me it seems like the calcium reactor really got them going again. Years earlier I had done this same experiment with very good results, but in the meantime I did a test taking the calcium reactor out, but replacing Ca and Alk with Kalkwasser. At that time I thought CO2 was likely to be a big player, but this test showed me it is not. That leaves Calcium and alkalinity as essential elements for dinos. On a sidenote most of the cyano left as well. At the time when there were almost no dinos left and SPS corals looked fine I had high hopes, but was quite sure there would be a twist. It's turning out to be a deadly one for my SPS. Having done this twice with very good results and a third to rule out CO2 is a step in the right direction. The plan is to do another round with an improved method, but with less corals left it will take even longer. 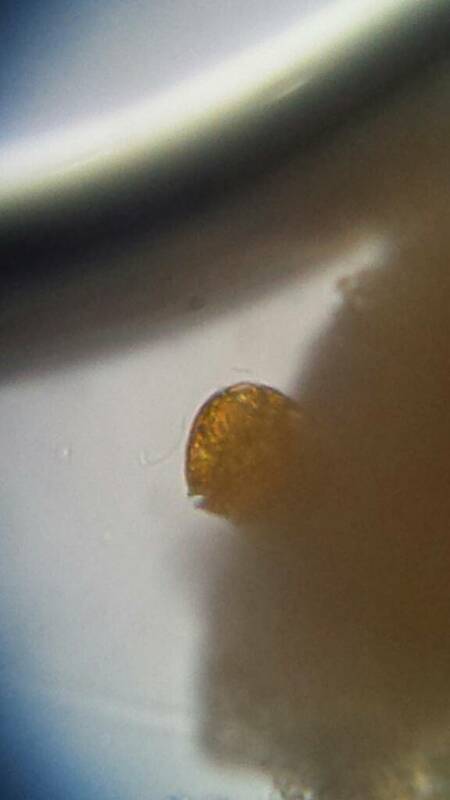 I secretly used a microscope for 2 algae samples at work. I spilled the sample I really wanted to look at (Dinos) and I saved the other. The second sample came from the top of my return hose. I'm hoping it's hair algae. Do anyone know a site I can id a few things? Took microscope samples from a few different spots in the tank and sand bed. Brown dusty area in back of tank: amphidinium dinos outnumbering any other visible moving organism 10 or 100 to 1 also small amounts of red cyano. Some different dinos (almost spherical, noticeable grooves in armor, spins with "one foot nailed to floor") outnumbering a very few amphidinium, lots of other organisms too equally represented with dinos. Edit: you can actually see the flagellum. It's a thin hair from the top of the dino extending to the left. Tons of life of all sizes, dinos barely present at all. Filamentous algae from fuge: no dinos lots of other things, mostly large. Finally, sample from bottom of skimmer cup: no dinos, lots of other things, mostly small. I feel like either by direct competition or associated organisms, having algae leaves no room for dinos, so I'm going to do what it takes to grow algae. If that doesn't work within a week to put algae back on upswing, I'll take more aggressive algae growing measures. Last edited by taricha; 01/23/2016 at 10:47 PM. LOL -- I stand corrected. I don't suppose you know a rhyme for orange or silver, do you? I'm sorry to hear you lost of bunch of corals and that the dinos came back. Is this experiment related to the green stuff you reported punching through the dino mat and then disappearing? CO2 limitation looks like a nonstarter, as carbonate equilibrium comes into play and HCO3- breaks into CO2 and OH- when CO2 gets low. Since some of the Proteobacteria ostis associate with are facultative anaerobes, you may have found a new way to mess with the dinos' bacteria farms. No the green stuff I have not seen since then and I realize things in reef tanks are often more complex than they look. What I'm saying is that I may have found the lowest levels of calcium and alkalinity that dinos can live with. I entered this hobby for the corals and seeing them dying once more is a sinking feeling. Throughout the years this whole dinoflagellates ordeal has been a pain, but at the same time an interesting challenge like no other. One of the odd things that shine through are the constant low calcium levels and the total lack of precipitation in the presence of large calcium and kalkwasser reactors running a full efficiency. At the same time the corals grow little or nothing at all. I'm leaving these findings in the cosmos for someone else to pick up. Next round is going to be something less deadly. To this after 8 days using the method I previously posted. As per another who has posted a method to remove them, it's not short or easy. There will be casualties. You may notice I only had 3 SPS and a few softies/LPS, however those who advised me of the methods did the same with large scale SPS tanks. If you want to know what worked, have a look at my previous posts and if you have any questions, feel free to PM me and I'll help as best I can. Good luck with your battle. It is winnable. Last edited by tastyfish; 01/24/2016 at 08:26 AM. I'm confused - Are you saying that dinos need calcium? or the opposite? tasty - your method was to physically siphon them out and maintain ultraclean conditions in an extended blackout with introduction of fauna. Pretty much along with raised pH and detail on replacement water and feeding the fauna to maintain population. Last edited by tastyfish; 01/24/2016 at 02:02 PM. These are the dinos in the brown dusting at the front of my tank, different from the amphidinium in the back. ID help or some names to image search? 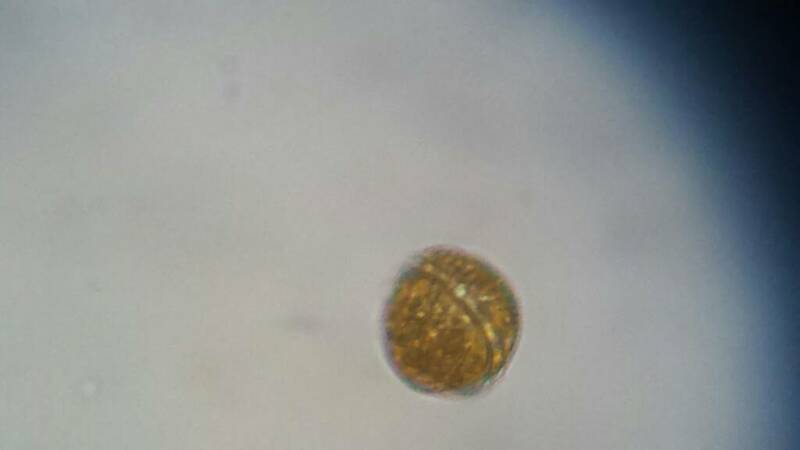 DNA, have you been checking water samples for the presence of coccolithophores? 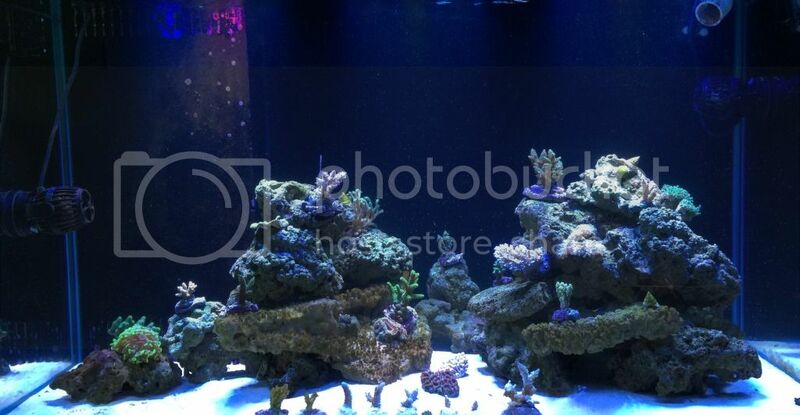 Are there more dino-reefers out there having problems with their parameters? My system holds 400g, but my kalk stirrer and calcium reactor designed to maintain 2400g are not keeping up. Correcting the levels only holds for a short time and 400 is the highest calcium level I've been able to maintain recently, but it used to be lower. Yes. I dose 2 part via brs dosers and kalk through ATO and I can't get my Ca above 380 and my alk above 7.5 dkh. No precipitation on pumps/heaters here either. I just recently started the kalk, and I almost doubled the 2 part dose( 96 ml per day of each part, up from 55 ml), the only parameter that changed was my pH went up about .2. Ca of 350, alkalinity of 5 and Mg at 1300. I have even less dinos than last update. Cyano is still going strong but only half so compared to two weeks ago. My display tanks algae is at around 25% from its high. It's been five weeks since I lost most of the dinos and by the rate things are going it could be a clean tank in another five. The immediate change in the corals was amazing so there is no doubt about the ill effect dinos have on them. They colored up in a few days and growth that had been none before was noticed. The most drastic action I did was to turn off the calcium reactor. Three days later the dinos crashed. Maybe the cocos crashed first and took the dinos down with them because they didn't have enough food at night to sustain the bloom. Of course, this all assumes ostis are preying on cocos, but it's a reasonable assumption. As noted, cocos and dinos sometimes co-occur in the wild. Dinos are often seen on the edges of a coco bloom, so I'd guess the cocos are holding the dinos off with chemical warfare, but concentrations at the edges of the bloom are low enough for dinos to nip in and snag themselves a meal. At any rate, narrowing the parameters to Ca and alk seems to point to a calcifying organism, so it seems reasonable to put cocos back on the table for consideration. Interesting development. I purchased two corals one week apart, both got attacked by dinos while the rest of corals appears dino free and are growing. 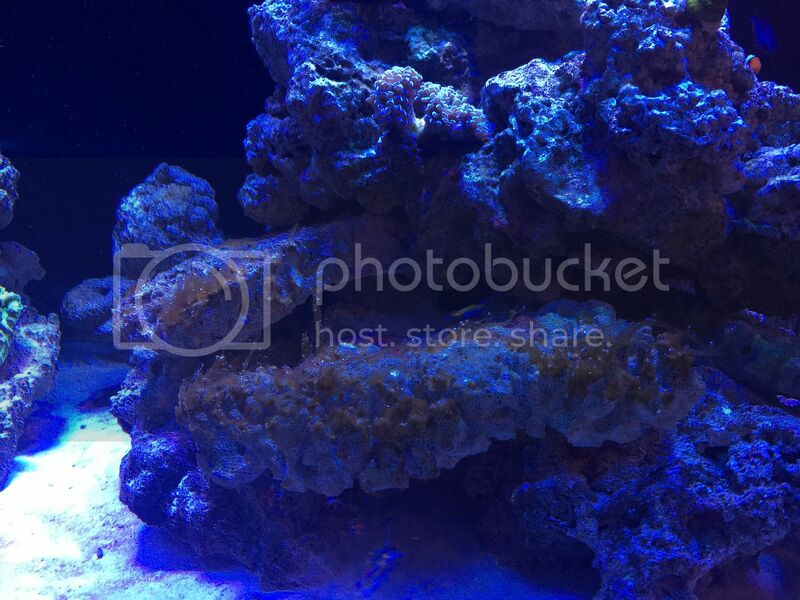 It appears my other corals developed immunity while new guys need to be blow off several times per day. Then I decided to dump 16oz homegrown phytoplankton. All dinos disappeared within the hour! I have speculated about coccolithophores before, but didn't even try to take a look under a conventional microscope due to their small size. If you search for a picture all the identifiable ones are taken with an electron microscope. I've found some larger calcareous particles sitting on the rocks, but it's hard to figure out if they are produced in the tank or came with the sand. Even though the water looks clear I do have a lot of large floating particles. This makes one think it is not just the onset of darkness that signals the free swimming period for dinos. 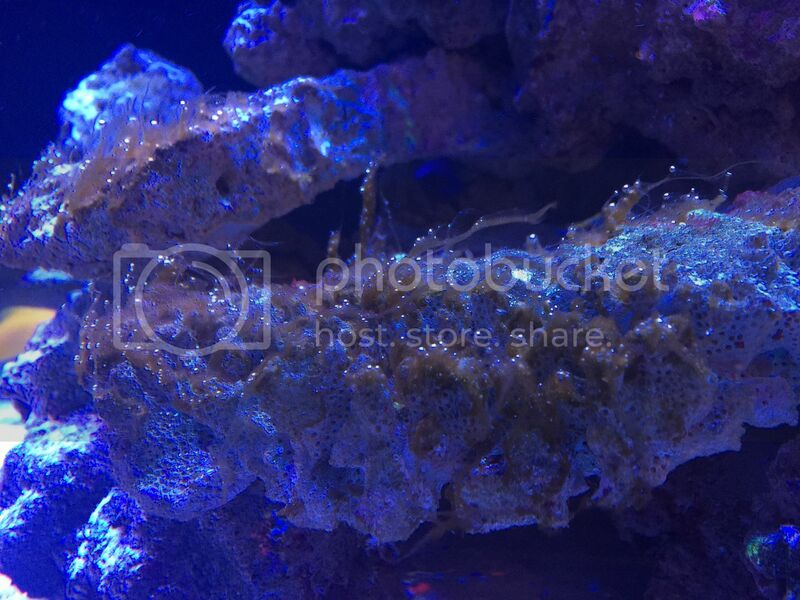 I have noticed this in my tank that the dinos start to leave the sand before lights go out. 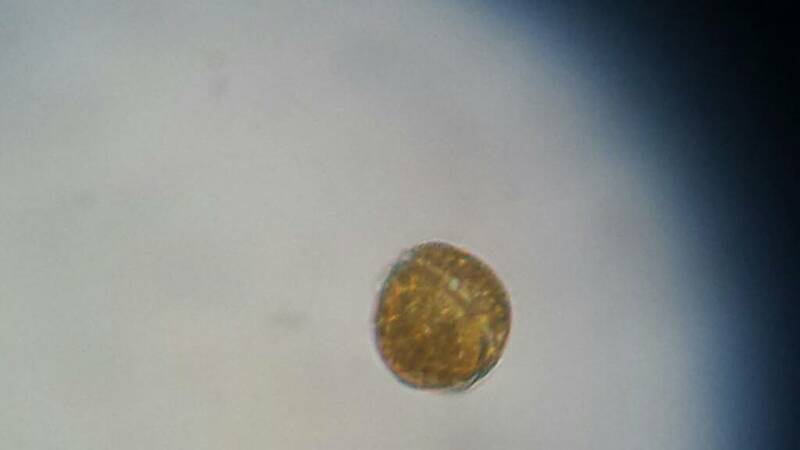 Well, it might be some sort of Protoceriatum, but I don't know anything about dinoflagellate taxonomy. The visible grove is a clear indication of a dinoflagellate. "The researchers developed a method to rapidly test aquaria for toxins". The rest of it is found below, but the above statement is the juicy part. 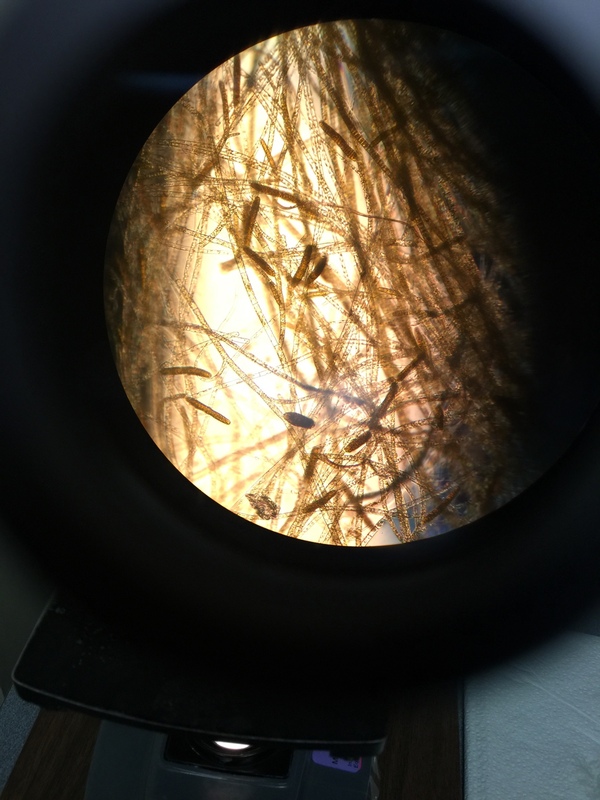 seamonster, have you looked at water samples under your scope before and after adding the phyto? i'm really curious what is happening to dinos...have you (or anyone, really) tried just adding drops of phyto to a slide of dinos? DNA, you should be able to see cocos -- IIRC, E. hux is the smallest coco and it's around 5-6 uM, which is larger than most bacteria, and stained bacteria are visible with a conventional optical microscope. Another approach would be to try filtering a few liters of tank water through a brown, unbleached coffee filter and seeing if you get a whitish residue when it dries. If so, test the residue with vinegar to determine if it's calcareous. Similarly, even if you can't see cocos well enough to identify the species, you should be able to confirm that they're cocos (or at least some form of calcifying phytoplankton) by adding vinegar to a microscope slide and watching bubbles form as their armor dissolves. I theorize that dinos disperse at night to hunt because they need to let their bacteria farms regenerate. Staying in the sand all the time would be safer, so there must be a reason they don't do it... My guess is that if they did, they'd nom through their food supply and crash. Maybe your dinos leave the sand early because they're running short of food and need to go hunting. Or maybe they've gotten used to the light cycle in your tank and know darkness is coming soon. 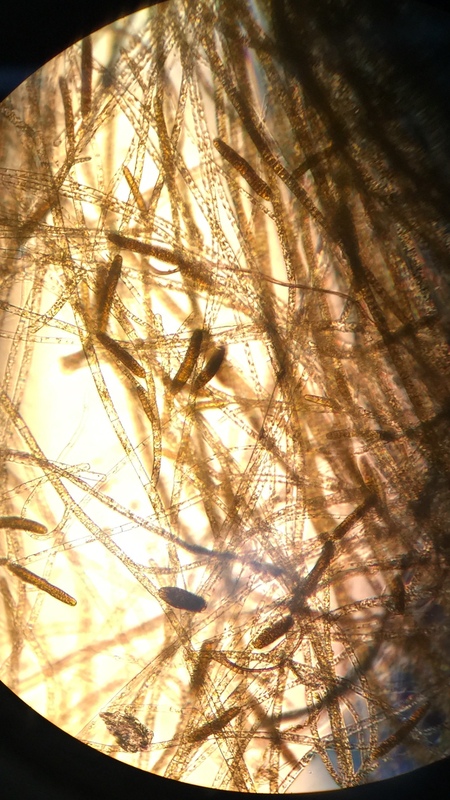 If it's green, that would seem to support the notion that the green phyto is hostile to dinos, and if it sticks, it appears corals can recruit bacteria from phyto to protect themselves. Though it bears mentioning that if your other corals have already recruited dinocidal bacteria, they probably would have spread to your new ones eventually. Yes, please. If this shows any promise, it would particularly valuable to test different species of dinos against the same species of phyto -- nannochloris, perhaps? Where did you start your culture from? I have the concentrated phyto from the lfs..think phytofeast, i do 5 drops daily and i have seen algae show up, should i do more drops to help the dino die?